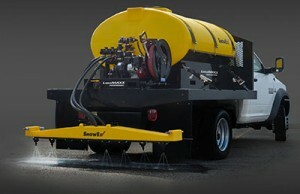 The Liqui Maxx spray system from SnowEx offers a customizable solution for liquid anti-icing and de-icing. With its modular tank, pump and boom design, the Liqui Maxx allows snow and ice professionals to virtually build their own sprayers. Liqui Maxx is available with four tank sizes: 300, 500, 750 and 1,250 gallons. The elliptical polyethylene tanks provide a low center of gravity, and include a sump for draining. The platform includes a 210 gpm wet-seal pump, powered by a 5.5-hp Honda engine, is specially filtered to handle all brine solutions. Liqui Maxx comes standard with a 98-inch-wide, adjustable-height boom.